Right now in the depths of winter, rain lashing against the window and snow on the high ground the stream fishing season still feels a long way ahead. Of course it is a good time to tie flies, clean fishing gear and generally have a bit of a tidy up and a sorting out of the kit but it is fishing that I really hanker after. The lakes offer some solace, the winter weather suits the fish up there in the mountains, they seem to like the chill- and frosty mornings with a bit of a breeze can provide some exceptional sport, but much as I enjoy it, lake fishing isn’t river fishing and that’s the rub. Dreams of clear streams, dry fly drifts and rising trout trouble my sleep and no amount of flytying or tackle cleaning will rid my soul of the need to be on a river. 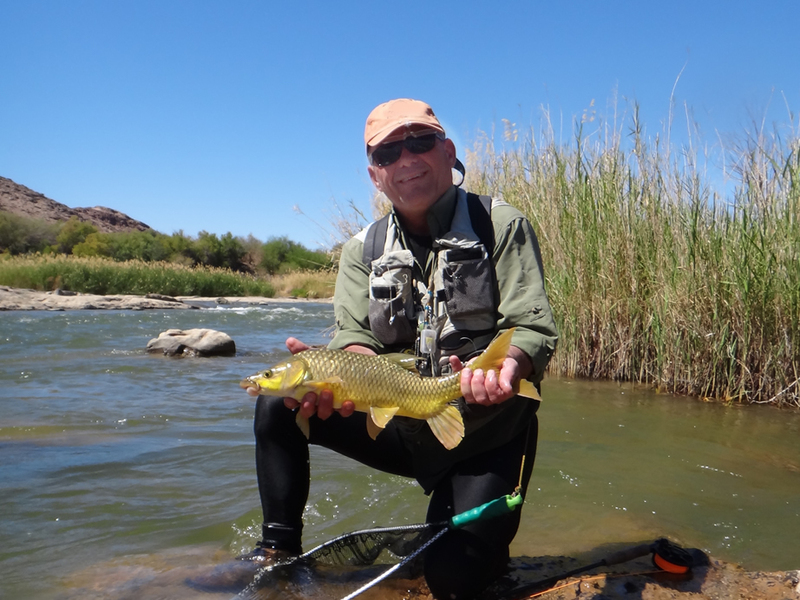 There is however a further alternative available, although perhaps not readily so, and that is to head out into the desert and target some winter yellowfish on the Orange River. It has become something of a ritual to include this in our fishing calendar, not only because such a trip offers exceptional fishing but also because the climatic conditions up there provide admittedly chilly evenings and mornings but rather more balmy weather during the day. Thoughts of warm days and plenty of fish when trapped in damp and chilly suburbia make a long drive and rustic camping conditions seem really rather idyllic. 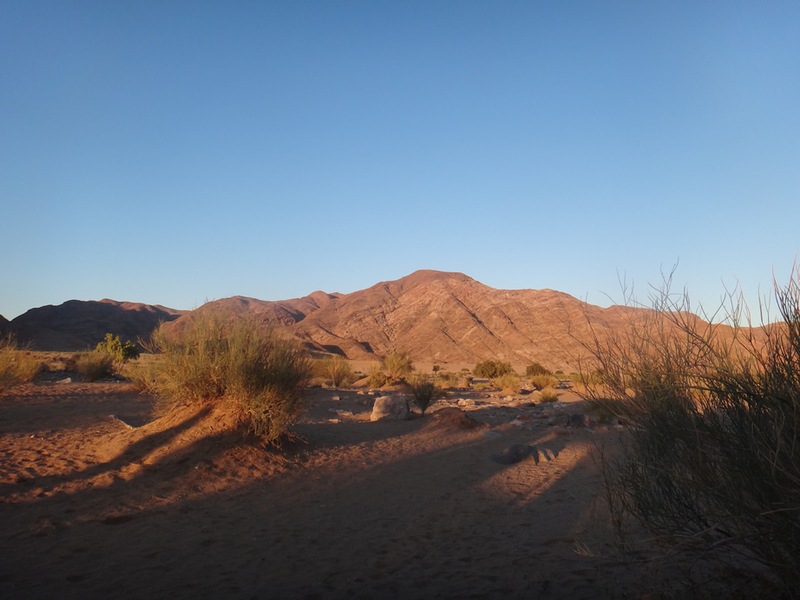 There was a time we would venture to the Richtersveld, a reasonably organized camping area within a reserve, it offered some great fishing it has to be said but these days we opt for an even more remote spot. 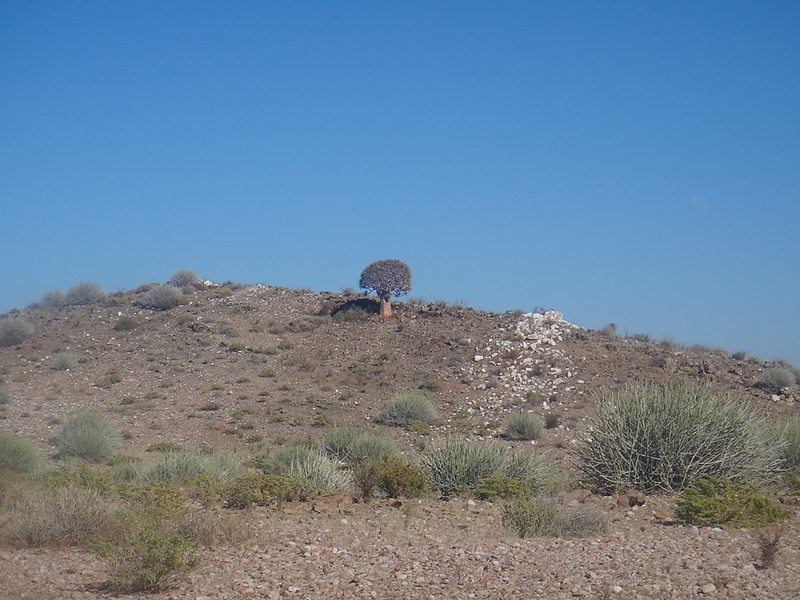 At the limits of the South African boundary, right on the Namibian border, where you may go for days without seeing anyone but for the occasional shepherd tending his goats in the arid landscape. This is barren land, given of rough tracks, social weaverbird nests, quiver trees, four wheel drive vehicles and a lot of space, enough space to make you wonder if you haven’t inadvertently switched planets via some unseen cosmic wormhole. 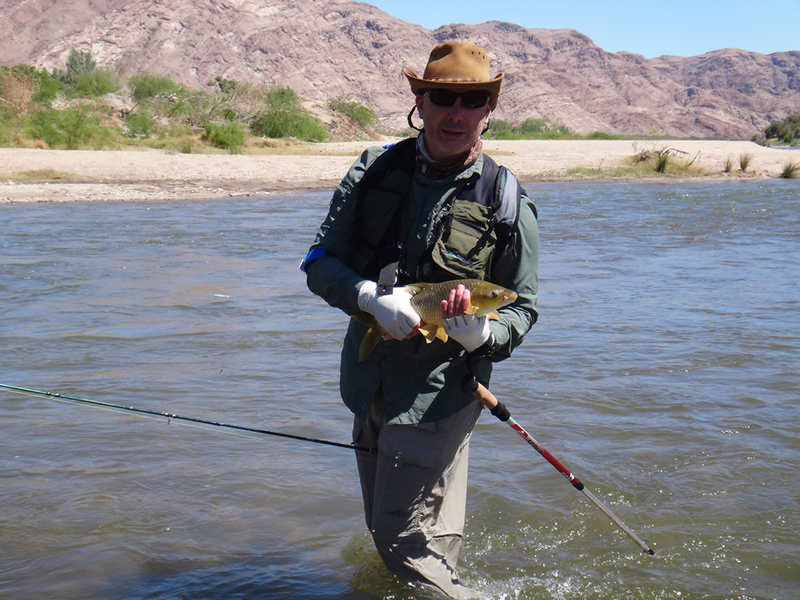 On the drive in it is easy to question one’s own sanity in bringing a fly rod along at all, the scenery, spectacular as it is, doesn’t imply any possibility of water, never mind fishing opportunity. This is a land of big sky, little but miles of sunbaked sand and rock and glistening quartz crystals with a primal beauty that has to be witnessed personally to be appreciated. Then, just about the time where one wonder’s if you really haven’t lost the plot, and that bringing that fly rod along would, in a court of law, indicate that you were too mentally deranged to be held accountable for your actions, you come across it. Cutting through the barren lands is a green swathe of vegetation, bordering the slightly murky flows of the region’s major river, and in that river await hoards of yellowfish. 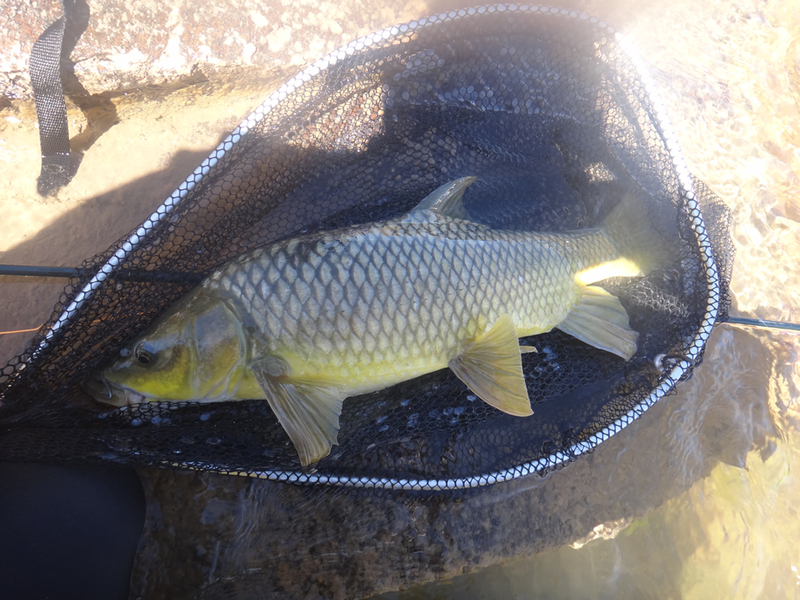 Better still hoards of naïve yellowfish, uneducated as to the wiles of fly anglers. In short something of an angler’s paradise, right out there in the middle of nowhere. As the temperatures high up near the river’s source drop lower during the winter months so the fish move downstream to warmer areas and it is a fortunate happenstance that at this very time the flows of the river, generally driven by summer thundershowers in the Witwatersrand, become greatly reduced. The entire collective, of little rain high on the catchment and cooler temperatures in the head waters contrive to produce, lower down on the river, some of the best yellowfish fishing the county has to offer, right about the time that we are hankering to cast a line on moving water but still generally limited by the flood levels of our native trout streams. This September Inkwazi Fly Fishing in conjunction with Stream X will be hosting two camps in this remote spot. Each trip has space for only eight anglers and includes an overnight stop on the way up to the river to make it easier to get away after work and have an early start on the water the next day.